And those aren’t all the problems it causes. We all want to perform at our best, right? It’s hard to perform at a high level when you’re forgetful, your thoughts are racing, your attention span is measured in seconds, and you have an impaired ability to learn. It makes you stupid. It wipes out your ability to do higher level thinking, be creative, engage in sound reasoning, and make good decisions. Oh, and it makes you emotional … moody, irritable, fearful, overwhelmed.Throw in unfocused, unmotivated, lethargic, and depressed … the result of lowered serotonin and dopamine levels … and you have a killer combination. If this were something you could see and touch, you’d avoid it like the North Pole in January. But it’s circulating in the bloodstream of every one of us 24/7. So what is this invisible marauder? 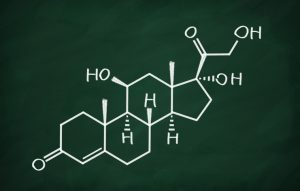 Cortisol is a hormone produced by your adrenal glands in response to stress? Anybody stressed out there? Yeah, me too. It’s not as if your body has a design flaw. In the proper amounts, cortisol helps regulate metabolic function. More importantly for our understanding, this stuff shuts down the systems you don’t need when you’re facing a threat and you need to fight or flee. One of the key things it does is reduce inflammation and pain from injury, so you can continue to fight or run in a pinch. Those are very useful things if you do a lot of fighting or fleeing, but in modern life, we tend to do a lot more fretting and stewing than running away or duking it out. The stressors we encounter aren’t here and gone … like a life and death encounter with a wolf or a member of a hostile tribe. They’re ongoing and more permanent in nature, like feeling overwhelmed trying to meet deadlines at work … on top of taking care of problems on the home front … on top of worrying about all the crises in the world. Cortisol is designed to help you cope in the short term and then disappear. When you chronically overproduce this stuff and stew in it day after day, you develop chronic illness and compromise your ability to perform. You aren’t going to sleep well. Your heartbeat is likely to become irregular. And you probably won’t even feel like taking on much of anything, because you’re feeling frazzled and exhausted rather than strong and capable. To add insult to injury, it’ll cause you to gain weight! So, if it’s a fact of life, always there, what do you do about it? Control how much of it you produce by limiting the amount of stress you put yourself under … and release the cortisol from your system as fast as you can once it’s dumped in. And that’s what we’re going to talk about next month … the ways you can reduce cortisol levels overall and put yourself back in hormonal harmony once you’ve been dosed. Until then, avoid any unnecessary stress and take time to really relax and breathe. Your health … and your life … depend on it.